Oh the joys of vintage shopping—there’s the thrill of the hunt for the perfect find, the triumph of finding the perfect cocktail dress for your next party, and the glee of knowing you’ll have something that no one else will have. If you’re new to shopping for vintage and find the process a bit daunting, here are five important things I’ve learned along the way that will help make the experience easier and less worrisome for you. Ready to dive in? Let’s do it! There will be times when you’ll find something vintage you really love, but it just doesn’t fit you right. Don’t despair and make the mistake of letting something go which turns out you can get altered to fit you exactly right. All you need is a great tailor. A little work goes a long way and you’ll end up with a bespoke garment that will look like it was made just for you. Trust me, it’ll be worth the extra moola. Three of the most important measurements to know are your bust, waist, and hip measurements. Most vintage online shops, mine included, list the garment’s measurements taken with the garment laid down flat and doubled where appropriate. What I do when I shop online is to compare my body’s measurements with the garment’s, keeping in mind I need some room around the bust, torso, and hips for movement and comfort. Another thing I do is I measure a similar item I already have in my closet and use that for comparison. This works well with clothing that’s irregular in shape, i.e. a ’60s A-line shift dress. When in doubt, feel free to ask the seller for additional information and an approximate size if he/she hasn’t already mentioned it in the item’s description. 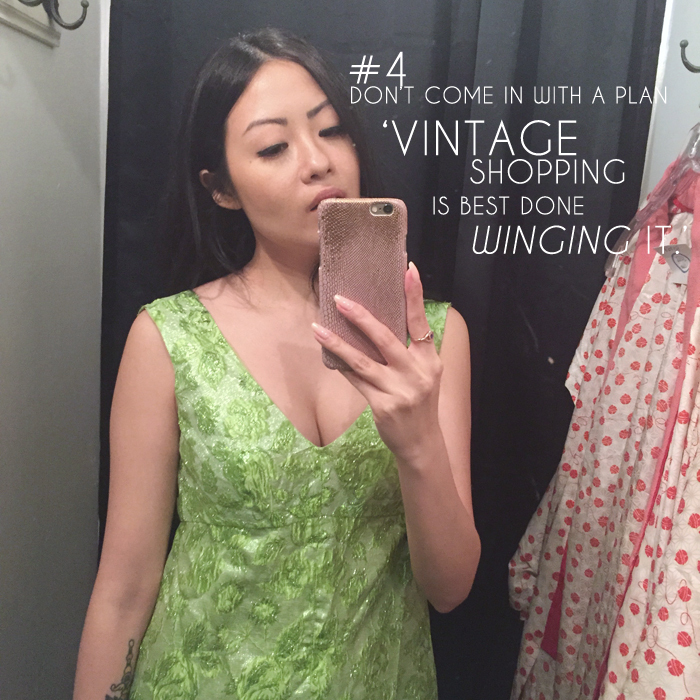 Vintage shopping is best done winging it. You may be looking for a 1970s boho maxi dress in white lace, but odds are you may not find something so specific. Inventory in vintage shops, thrift stores, and market stalls change all the time and you’ll never know what to expect—that’s all part of the fun! Keep an open mind, take a deep breath, and dive in. Last but not least, bring provisions, i.e. bite-sized snacks, a bottle of water, even a tape measure may come in handy! Vintage shopping can be an all day affair and when you’re really stuck in, it’s easy to loose track of time. At least you’ll be prepared. Stay tuned for my upcoming post on ‘Five Tips to Buying Vintage Online.’ Feel free to subscribe to my blog on Bloglovin’ here to get notified as soon as I publish a new post. Previous Post OOTD: Today, I’m rocking a twin set. Next Post OOTD: Today, I’m Partying Like it’s 1959.